The art object PATTERN OF LIFE is guaranteed to be a real eye-catcher in your home. The sculpture is made of wood and stands on a black base plate. No matter where you place it, the decorative figure, which has been made with great attention to detail, exudes a natural modern flair. PATTERN OF LIFE - sometimes a little interwoven and squiggled and detoured. Everybody may have a different pattern in his life, but it is always interesting and varied, like our wooden sculpture of the same name. Place it on a shelf or sideboard in your entrance area and make sure it is an eye-catcher when you enter your home. The wooden sculpture also attracts attention in the living room and dining room. However, PATTERN OF LIFE can not only be used in the private sector, the handmade figure can also refine public rooms such as offices, bars or waiting rooms. Let your creative streak run wild. 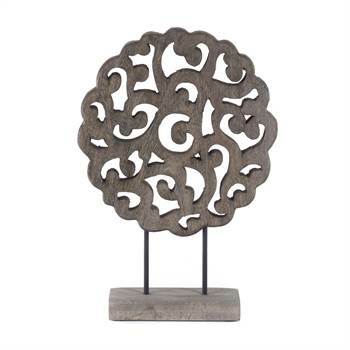 The sculpture PATTERN OF LIFE provides a decorative highlight in your rooms. Measurements (app./HxWxD): 45x32x10 cm; the dimensions vary, as each specimen is unique. For a natural modern flair in your rooms. Also ideal as an unusual gift idea. You will find more beautiful and unusual decorative items made of wood and other materials in our shop.